Fort Jackson 282nd Brass Band Veterans Day Concert - Nov 11, 2018 - Partners - Columbia Chamber of Commerce ? FORT JACKSON, SC - The Fort Jackson 282nd Band will play a free Veterans Day concert Nov. 11 at 5 p.m. at Trinity Episcopal Church 1100 Sumter Street in Columbia, S.C.
Fort Jackson and the Columbia community will celebrate the centennial of the Armistice ending World War One. The performance will consist of a choir consisting of brass and percussion, along with an organist, Debbie Bauer. The concert will feature music for brass and organ by J.S. Bach, Aaron Copland, Marcel Dupre' and Maurice Durufle'. 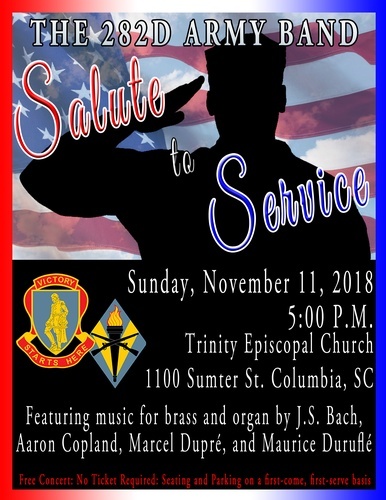 This is a complimentary concert provided by the Fort Jackson 282nd Army Band and Trinity Episcopal Church.